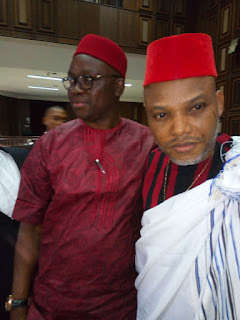 The father of leader of Indigenous People of Biafra, IPOB, His Royal Highness, Eze Israel Kanu, his wife Ugoeze Sally Kanu, have rejected the bail conditions given by Justice Binta Nyako of the Abuja High Court to free his son, Mazi Nnamdi Kanu, saying Kanu should be released unconditionally. In fact, both the father and the mother, Ugoeze Sally and their daughter Chinwe, faulted Justice Binta Nyako for the bail condition given to Nnamdi to be freed. Speaking to reporters at Isiama Afaraukwu, Umuahia North Council, Eze Israel Kanu said while the family was happy over the bail granted their son, they rejected the bail condition, saying that the conditions attached to it was not necessary. Governor Ayo Fayose and Nnamdi Kanu at Federal High Court Abuja According to the monarch, “the bail conditions was like giving something with one hand and taking it with the other hand. “The IPOB leader must be set free without any condition attached. “The federal government should release my son unconditionally. The world should judge if the bail conditions are proper”, the monarch said. He explained that he was happy when he received the news that his son had been granted bail by the court, but was taken aback by the condition attached to it. Eze Kanu was not happy with Justice Nyako for asking the IPOB leader to produce a Jewish leader as surety and wondered why a court of competent jurisdiction would demand for a citizen of another country as surety in Nigeria. Flanked by his wife, Ugoeze Sally and daughter Chinwe, the monarch also faulted other bail conditions given to his son, including that a Senator from the South East zone with a whopping N100 million bail bond. Corroborating her husband position, Kanu’s mother noted that if her son eventually returns home she would advise him not to abandon the agitation for the restoration of Biafra. She equally stated that without Kanu’s activities the world would not have known about the problem of Biafrans in Nigeria. “No retreat, no surrender; God will deliver Biafra as He delivered Israel”, she said. Meanwhile, thousands of MASSOB members in Umuahia went into wild in jubilation. In a statement issued by the MASSOB leader Comrade Uchenna Madu which reads thus, “The bail granted to our brother today is a triumphant sign of light over darkness. It is a motivational factor that Biafra will always triumph over Nigeria. I spent almost four years in different prisons from 2005 to 2009 which includes Suleleja, Keffi and Kuje prisons for same purpose of Biafra and was later released. “Know that we are the true representations of Biafra and genuine struggle for the liberation of the people of Biafra”. “Nnamdi Kanu and others won’t be an exception. He represent the interest of the people of Biafra, he is not a criminal. MASSOB commends the efforts of Igbo Governors, some prominent and eloquent leaders like Mr. Peter Obi, Chief Nnia Nwodo (Ohaneze President General), Gov. Ayo Fayose, some Igbo National Assembly members, Nzuko Umunna and other progressive persons for their unflinching efforts in compelling the Federal Government to grant Nnamdi Kanu bail. “As the people of Biafra erupted in jubilation all over the world in celebration of triumph of light over darkness, it shows that we are more united in our pursuit for Biafran actualization and restoration irrespective of our different organizations. We know that freedom can never be achieved on a platter of gold. “MASSOB also demands for the release of other pro-Biafra detainees in other prisons, including those at Onitsha and Awka prisons. MASSOB and other pro-Biafra groups, including IPOB are on the ground, ready to welcome and receive our brother, Nnamdi Kanu”, Madu said. In his reaction, the Chairman of South East Caucus of Interparty Advisory Council, IPAC, Prince Emeka Okafor while welcoming the bail rejected the conditions attached to it, saying that it amounts to denying him his fundamental rights. According to him, IPAC frowned at the bail condition given by the Judge, saying that the Judge has deliberately denied him some of his fundamental human rights. Okafor however commended South East Governors for joining IPAC in calling for the release of the Biafran activist and called for the extension of the bail to others being detained with Nnamdi Kanu. What a courageous family and a fearless son. I'm so proud of you all. You are designed, created, and called to deliver the people of God - Biafrans from the murderous sharia Islamic lawless state of Nigeria. May God be our strength as we march on to enter into our Promised Land?